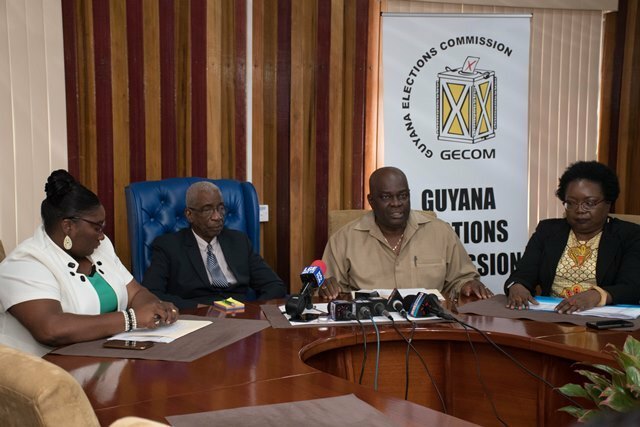 he Guyana Elections Commission (GECOM) said it is currently working to address electoral ties in three constituencies across the country. Chief Elections Officer (CEO), Keith Lowenfield said the elections body is now able to legally handle the situation. He was speaking to members of the media earlier today at GECOM’s head office. Chief Elections Officer of GECOM, Keith Lowenfield is flanked by Chairman (retd) Justice James Patterson, Public Relations Officer Yolanda Ward and Deputy Chief Elections Officer, Roxanne Myers. “[The ties] are in constituencies in the Hague Blankenburg Local Authority Area (LAA), in Soesdyke/Huist’Coverden LAA and one of the constituencies in the Kwakwani Neighborhood Democratic Council,” the CEO reported at the press conference. Lowenfield said GECOM is following the procedure laid out in the 2018 amendment for the resolution of the ties. “… the ties are identified and we are moving to ensure that they are correctly done within the letter of the law to have these ties resolved,” he said. According to Lowenfield, of the 573, 928 voters registered to vote in this year’s LGE, only 208,534 persons participated, representing a 36 per cent turnout when compared to 2016. There were 1,676 polling stations across the 80 Local Authority Areas. Barring the low turnout, the CEO said there was a high level of efficiency observed across the country. The APNU has won the five municipalities of Georgetown, New Amsterdam, Linden, Bartica and Mahdia, whilst the PPP won the remaining five.